Okay, so maybe your client has asked you if they should offer a 401(k). Or maybe you’ve suggested that they offer one. Either way, do you really know how to help them pick the right plan? There are lots of variables to consider, so you’ll want to be familiar with all the angles. What should acountants look for in a 401(k) provider? When a business chooses to offer a 401(k) plan, there are a number of responsibilities that need to be accounted for. Some full-service 401(k) providers handle most or all of these responsibilities, or plan sponsors can use multiple vendors and/or take on some of the work themselves. Plan design and setup: Prepare required plan documents, coordinate contributions with your payroll provider and custodian. 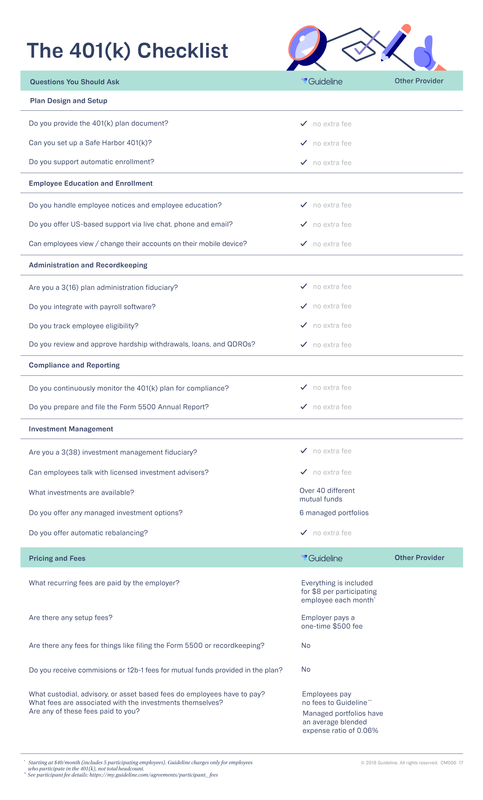 Enrollment and education: Manage participant eligibility and enrollment, explain your plan to employees, educate them on investment options, and give them required information, notices and disclosures. Administration and recordkeeping: Deposit contributions and deferrals with the custodian, and keep track of all transactions and balances. Distributions & Benefit Payments: Administer participant and beneficiary benefit distributions, loans, hardship withdrawals, required minimum distributions and Qualified Domestic Relations Orders. Investment management: Choose a diverse selection of investments. Ensure investments are selected and maintained with the best interests of employees in mind. In advising a client, you should be looking to help them find a provider that does all of these things well — and at a reasonable cost to the business and plan participants. For example, many providers pass a lot of their expenses on to employees through high fees on assets under management. Others charge additional fees for certain aspects of their service — like annual Form 5500 filing — or outsource portions of their service to other providers who charge their own fees. Get a printable checklist here. In addition to the responsibilities above, you may also want to look for a provider that makes it easy to manage the 401(k) plans of multiple clients. When you’re looking at providers, you may want to ask whether they have a single interface to keep all your clients organized. Or whether their service automates some of the administration by integrating with the accounting or payroll software you use.